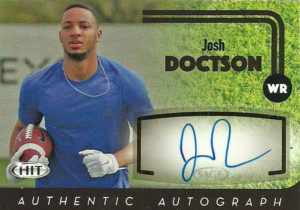 Well Josh Doctson rocketed up charts his Senior season at TCU in 2015. The receiver caught a school record 79 balls as a Senior, for 1337 yards and 14 TDs. What’s more amazing is that he finished his career second on the school’s all-time chart despite starting his career at Wyoming, before transferring to TCU. A master technician, Josh runs really clean routes and has pretty solid hands. Despite some injuries in 2015, he was a lock for the first round in a weak wide receiver class. After Corey Coleman came off early, Doctson was my targeted receiver for the Texans to take, but Houston elected to go for burner speed instead and selected Will Fuller out of Notre Dame at 21. On the very next selection the Redskins picked Doctson. Josh suffered from really bad luck his rookie season, as an Achilles injury he got during the preseason, nagged him all year long. He finished 2016 with 2 receptions for 66 yards, before being shelved on IR for the year. Josh started picking up steam in 2017 with 35 receptions for 502 yards and 6 TDs, including a 52 yard snag. As the Redskins transition from Kirk Cousins to Alex Smith at quarterback, it should be interesting to see how Doctson plays into the team’s offensive plans moving forward. I sent off for his autograph right before the preseason broke up in 2016, but I must have missed the boat on him signing as I have not seen any returns from him since that timeframe. Luckily enough I pulled this from a leftover box of Sage that was in a discount bin at Walmart.